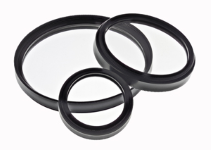 This clear lens cover provides an additional layer of protection for expensive optics. No lens threads are needed, since it just slips over the object end of the lens. Three recessed set screws hold it in place. To clean, simply remove it from the lens, bring it to a sink and use water and a soft cloth, letting it dry before returning it to service. Your imaging system can keep working while you’re cleaning this lens cover.